Arguably one of the most anticipated coin programs of the decade debuts today, Jan. 24, with the launching of the 2019 Apollo 11 50th Anniversary Commemorative Coins. Interest in the coins stem not only from their subject matter, but also their unique design features and specifications. Seven different Apollo 11 coins and one special Kennedy half-dollar have been minted. They launch at noon EST. Apollo 11 50th Anniversary Commemorative Coins include proof and uncirculated $5 gold coins, silver dollars, clad half dollars and a first for the U.S. Mint — a proof five-ounce silver dollar with a reeded edge and a curved shape. In fact, the dome shape carries through to the other six Apollo 11 coins as does basic design elements. Of note, the silver dollars are struck from 99.9% pure silver. This is a change from previous silver commemoratives which were produced from 90% silver. 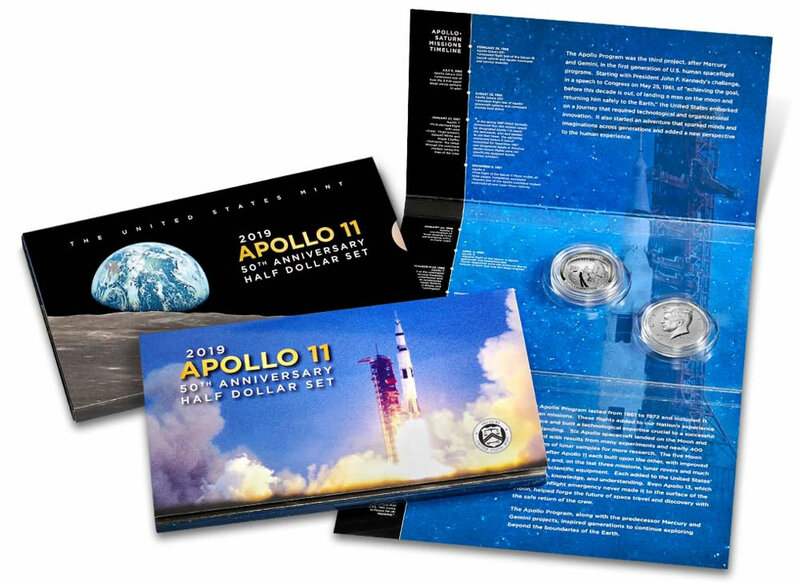 As an added incentive for collectors, also available at noon is a limited-edition 2019 Apollo 11 50th Anniversary Half Dollar Set containing a 2019-S Proof Apollo 11 Half Dollar and a 2019-S Enhanced Reverse Proof Kennedy Half Dollar that recognizes the relationship between President Kennedy and the American space program. Both of the set’s 50-cent pieces were minted at the U.S. Mint’s facility in San Francisco. Congress authorized the coins with the passage of the Apollo 11 50th Anniversary Commemorative Coin Act. The Act became Public Law 114–282 when it was signed by President Obama on Dec. 16, 2016. 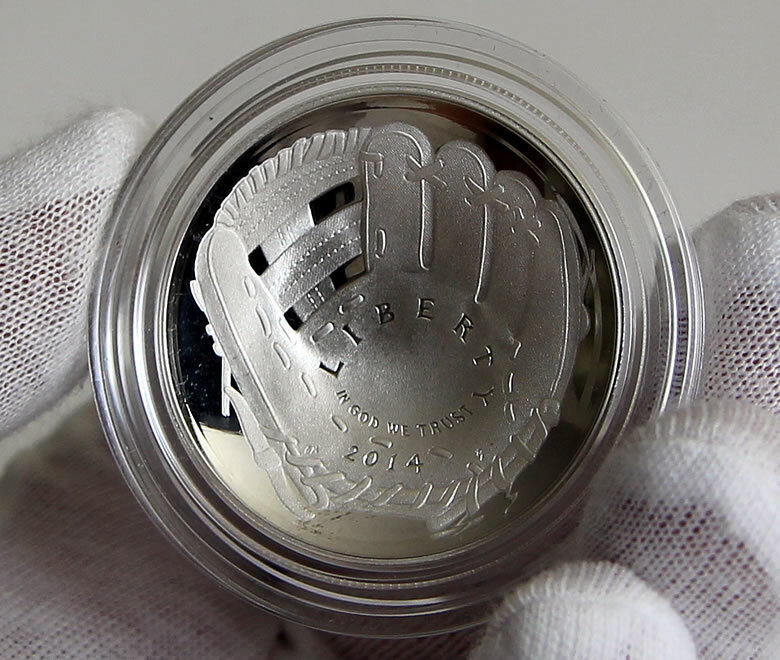 As part of the law, Congress dictated the coins be issued "in recognition of the 50th anniversary of the first manned landing on the Moon" and to have a unique curved shape similar to the 2014 National Baseball Hall of Fame Commemoratives. Also, Congress required a competition to come up with the coins’ shared obverse (heads side) design. Belfast, Maine artist Gary Cooper won from among candidates unveiled in October 2017. Cooper’s design features a booted footprint on the lunar surface. Surrounding the image are phases of the Moon which separate the inscriptions of MERCURY, GEMINI, and APOLLO — all NASA space exploration projects. This U.S. Mint photo by Jill Westeyn was taken Dec. 13, 2018 during an Apollo 11 Commemorative Coin ceremonial striking event at Philadelphia. It shows the obverse (heads side) of a proof Apollo 11 Silver Dollar. IN GOD WE TRUST, LIBERTY and 2019 are also inscribed along with the appropriate mintmark, Cooper’s initials, and the initials of U.S. Mint sculptor-engraver Joseph Menna. Each coin also has a common reverse. The general design was outlined in Public Law 114-282 with candidates reviewed in June 2017. 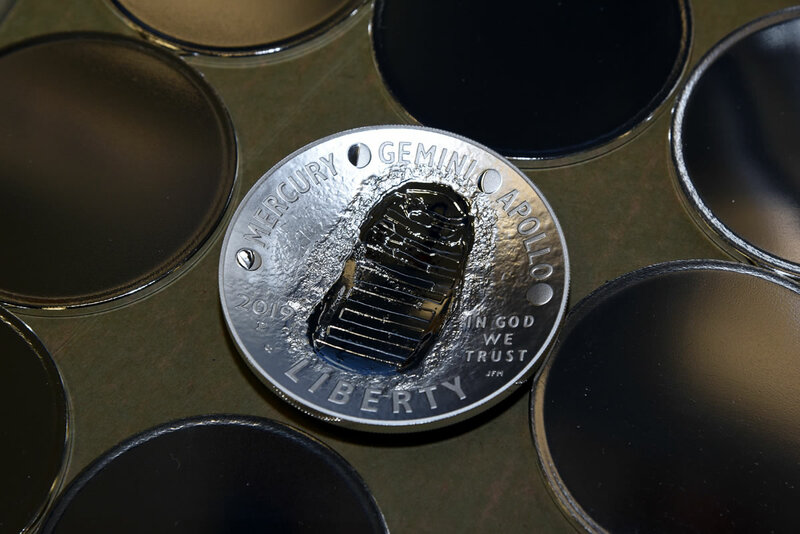 Engraved by U.S. Mint Sculptor-Engraver Phebe Hemphill, the design depicts a representation of a close-up of the famous ‘Buzz Aldrin on the Moon’ photograph taken July 20, 1969. It shows part of Aldrin’s helmet with its reflection of astronaut Neil Armstrong, the United States flag, and the lunar lander on the surface of the moon. This U.S. Mint photo by Jill Westeyn was taken Dec. 13, 2018 during an Apollo 11 Commemorative Coin ceremonial striking event at Philadelphia. It shows the reverse (tails side) of a proof Apollo 11 Silver Dollar. UNITED STATES OF AMERICA, E PLURIBUS UNUM and the denomination of the coin appear around the scene. 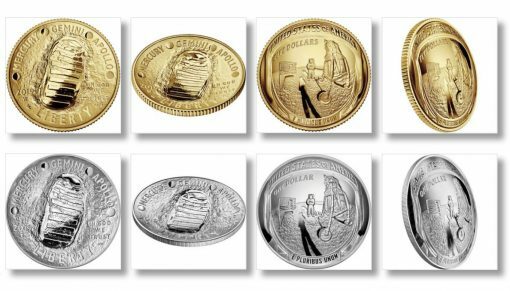 U.S. Mint images of all seven Apollo 11 coins are presented in this article. In related products, the U.S. Mint is offering the Apollo 11 50th Anniversary 2019 Engraved Three-Print Collection from the Bureau of Engraving and Printing — the agency responsible for printing U.S. currency. As part of the collection, the print entitled Mission launches today for $20. Buyers may also subscribe to the complete three-print collection which includes Mission and the upcoming prints of The Eagle Has Landed and Giant Leap. In addition, a joint United States Mint and Royal Australian Mint Apollo 11 set will include a U.S. Apollo 11 half-dollar and an Australian Moon Landing $5 silver coin. The set’s details and release date are yet to be announced. *Gold coin prices are set according to the U.S. Mint’s pricing matrix and they can change weekly. **Regular pricing goes into effect on Feb. 25, 2019 at 3 p.m. EST. 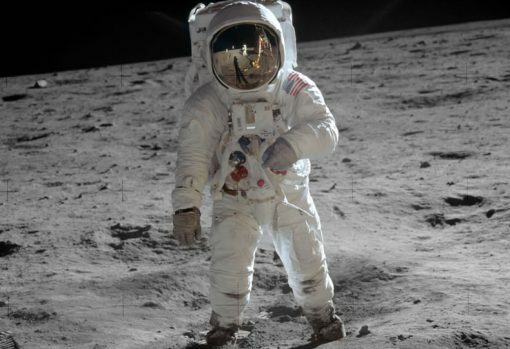 As outlined by their authorizing law, Apollo 11 product prices includes surcharges of $35 per gold coin, $10 per silver dollar, $5 for each half-dollar, and $50 for each five-ounce silver coin. The collected funds, as long as the coins turn a profit, will be distributed between the Smithsonian Institution’s National Air and Space Museum’s Destination Moon exhibition; the Astronauts Memorial Foundation; and the Astronaut Scholarship Foundation. 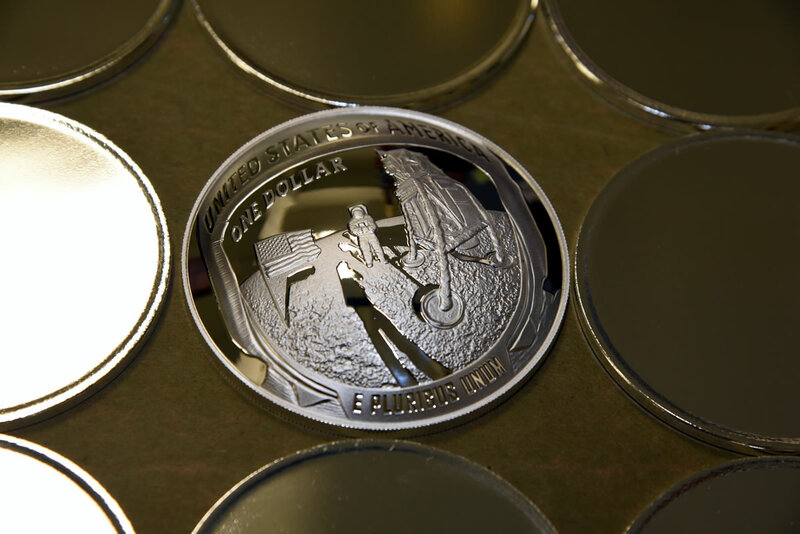 Beginning at Noon ET, the U.S. Mint will accept orders at catalog.usmint.gov and 1-800-USA-MINT (872-6468). Hearing- and speech-impaired customers with TTY equipment may order at 1-888-321-MINT. I will have to respectfully disagree with you about Mr. T. But for what it’s worth it does seem like there was more hope of a better tomorrow then. Now at that time the environment was starting to unravel without notice, racism and sexism were routine, and without understanding the real issues the US had bumbled into an unnecessary war. Yet politicians promised more, not just fear that people would lose what they had, and for working people personal incomes were still rising. Maybe Congress listened to more than campaign contributors then and indeed the public was willing to sacrifice rather than shop. Anyway, off the subject of some fun coins commemorating that era. My response to HSN on YouTube. And just like that he is fully stocked, slabbed, and in flip mode. Looks like Mike Mezack will add a free bowl of soup with each double the price coin sold. sorry ,LOL typo.Meant $425,.Note to self,proofread before pressing send.Anyway Mike sure has that PT Barnum persona. Hopefully someone here can guide me. I ordered five of these and they are all on “Back Order.” No big deal. But I really wanted one now, so I bought one for $279.00 on Ebay. Here’s my issue…. I really want to handle this coin, but for the life of me, I cannot get the coin out of the capsule and I do not want to damage the coin or the capsule. Personally I don’t handle my coins and leave them in the capsule. I am sure you know why. Unless you have clean cotton gloves for this purpose and are transferring to another holder, I would leave it alone. I love handling my coins (not all of them), and when I do I am careful and use cotton gloves, but I would like to feel this Apollo 11 5 OZ Coin. I have numerous other 5 OZ Coins (I love them) and to handle them is very cool. Any news on the joint US-Australian set? I have a novice coin collecting question concerning mintage. What does it mean when it`s posted “product limit, none” when the mintage limit is 100,000?